The Antarctic plate encompasses the continent of Antarctica and surrounding oceanic crust. It is the southernmost plate and is centered over the South Pole, with the Scotia, South Sandwich, Shetland, Nazca, African, Australian, Pacific, and South American plates all bordering it to the north. The continent of Antarctica, covering 14.2 million km2 (Andersen et al., 1990), is located over the South Pole and can be divided into two regions: East Antarctica and West Antarctica, separated by the Transantarctic Mountains (TAM). East Antarctica is a relatively stable Precambrian shield (Jiang, 2009), with very few earthquakes occurring in this part of the continent (Roult and Rouland, 1994). Archean and Proterozoic igneous and metamorphic rocks are found around the eastern perimeter of the continent and are assumed to make up the basement of most of the shield (ten Brink et al., 1997), with Devonian to Jurassic sediments overlying them, and intruded by Jurassic plutonic and volcanic rocks (Fitzsimons, 2000). Over 95% of Antarctica is covered in ice, which appears dome-like at the surface, but the underlying bedrock has a more complex topography. The thickest layer of ice in the East is approximately 4000 m, and the ice loading causes much of the craton’s rock surface to be below sea level (Roult and Rouland, 1994). The continental roots of East Antarctica reach up to 250 km in depth. The crust and mantle lithosphere were formed at the same time and have always been attached, making the continent very strong (Morelli and Danesi, 2004). The average crustal thickness of East Antarctica is about 35 km, and the oceanic crust around the continent is from 5 to 10 km (Roult and Rouland, 1994). Although most of the continent is covered in ice, the East Antarctic craton has about 3.5 billion years of geologic history and is expected to have remnants of past supercontinents. Over geologic time, it has undergone periods of extension and contraction during the break-up and formation of Gondwana, Rodinia, and Pangea (Harley et al., 2013). After the stabilization of the craton in the Archean and early Proterozoic, a high-grade mobile felt formed along today's coast of East Antarctica, followed by the Ross Orogen between the Neoproterozoic and Ordovician, which is situated at the Transantarctic Mountains at the edge of the craton (Fitzsimons, 2000). Once part of East Gondwana, East Antarctica began rifting from what are now Australia, India, and New Zealand during the Jurassic period (Fitzgerald, 2002). Today, about 95% of the Antarctic plate is surrounded by divergent plate boundaries: the Southwest Indian Ridge, the Southeast Indian Ridge, and the American-Antarctica Ridge. The continent shows an extensional tectonic regime, having many internal large rift structures such as the Lambert Glacier zone near the edge of the eastern side of the continent. The only subduction zones associated with the Antarctic plate are the South Sandwich and South Shetland Islands (Roult and Rouland, 1994). Fig: A model of the breakup of Gondwana from the early Jurassic to the early Cretaceous. From Fitzgerald (2002). Andersen, D.T., McKay, C.P., Wharton, R.A., Rummel, J.D., 1990. An Antarctic Research Outpost as a Model for Planetary Expoloration. Journal of the British Interplanetary Society 43, 499-504. Fitzsimons, I. C. W., 2000. A review of tectonic events in the East Antarctic Shield and their implications for Gondwana and earlier supercontinents. Journal of African Earth Sciences, 31 (1), 3-23. Harley, S. L., Fitzsimons, I. C., Zhao, Y., 2013. Antarctica and supercontinent evolution: historical perspectives, recent advances and unresolved issues. Geological Society, London, Special Publications, 383 (1), 1-34. Jiang, W.P., Zhan, B.W., Liu, Y.W., 2009. New model of Antarctic plate motion and its analysis. Chinese Journal of Geophysics, 52 (1), 23-32. Roult, G., Rouland, D., 1994. 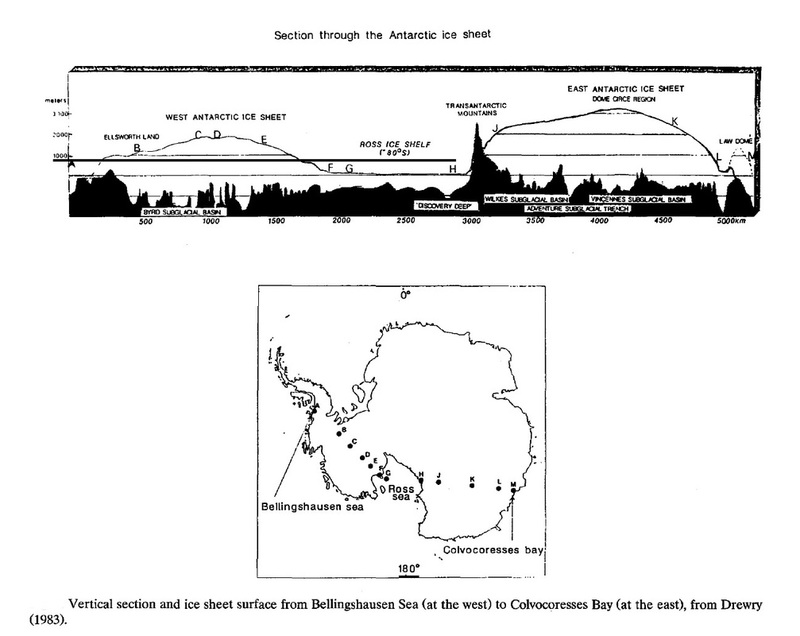 Antarctica I: Deep structure investigations inferred from seismology; a review. Physics of the earth and planetary interiors, 84 (1), 15-32.